The cardigan and dress are terrific. Sometimes I think teal needs a brighter color to go with it and you found it. Teal is a great colour on you, Monica, and the dress is SO pretty! What a gorgeous print. Oh Thank you Curtis! :) I havent used teal much, great to hear thats a colour I can wear. :) I prefer to take outdoor photos as the colours are more acurate presented in daylight instead of artificial light. I really hate artificial light, makes my face look all red and plastered. Definitely amazing entry for teal! It looks super gorgeous with the colors of the dress, and the shape is perfection. Stay dry! 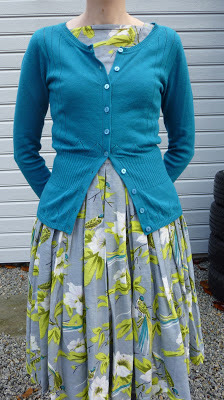 This is a lovely teal combination! I do understand about the blogger's challenge of getting good weather and especially good light : > Thanks for linking up to Visible Monday. Aww... you wore this teal cardigan beautifully! I really love how it looks with that gorgeous printed dress and those tights! The color combination look adorable and you look really pretty! The cardigan is perfect with that dress! What a wonderful pattern! What a gorgeous dress! Perfect with your teal cardigan too. I love the way you wear your sweater half-buttoned. This dress is so beautiful on you. 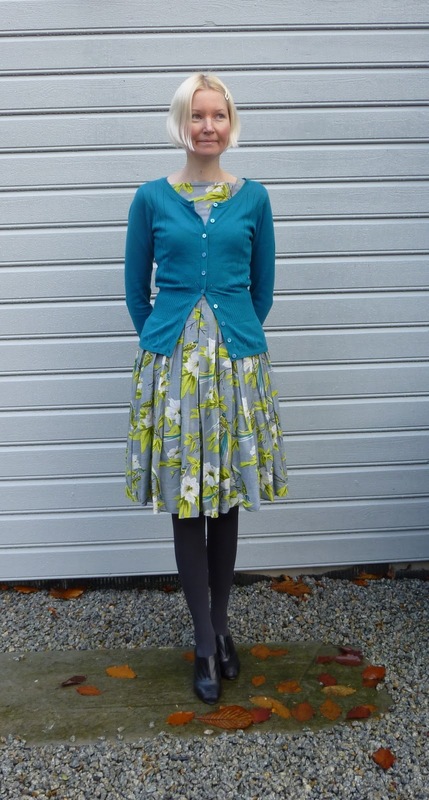 Fabulous dress - I love that it's birds, and that the cardigan picks them out by colour. Ditto Melanie's comment about the strategically-buttoned sweater, really lovely! 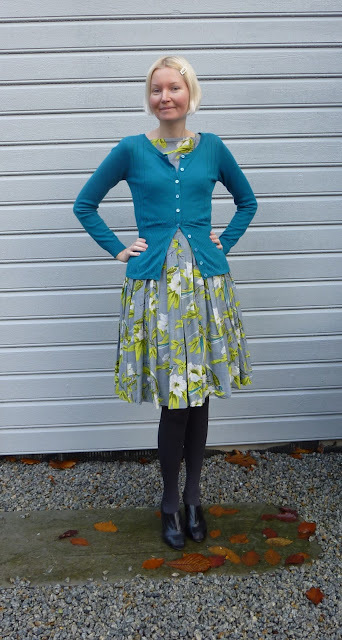 This lovely outfit feels retro in an awesome way! I love the restraint used in choosing the charcoal grey tights. I'm glad you persevered, and got photos despite the sketchy weather. I agree with everyone, but especially the retro look that also feels modern, and the colors! I love the teal with gray and yellowy-greens - it's a classy combination. You wear teal very well! The dress is so beautiful, i love the yellowish-lime with teal, it's such an unusual combination. I'm trying to take my photos outside for as long as possible. I remember how difficult it is to work with artificial lighting on indoor photos, all through last winter. In this case, and this case only, I can recommend hot flushes! Not that it brightens anything, but you can keep on taking photos in the freezing wind, without wearing coats or jackets! What a wonderful look. The sweater adds so much to this outfit. Beautiful! This is another gorgeous outfit. So elegant & girly. That dress is awesome. Love the colors and retro feel it has. Great cardigan, too.